The National Infrastructure Bank is making a lot of noise inside the Beltway. Not difficult to imagine why. Here is another big-ticket item that is bound to keep lobbyists and politicians in hyperbole mode for months. The White House shouldn’t have to rev up the PR machine on this one. The nation has ignored investing rebuilding and modernizing existing infrastructure and adding much-needed new capacity. Take a spine-jarring ride to almost anywhere these days and the need is obvious. Our nation and others are on the way to becoming Third World nations where infrastructure is concerned. Commerce will suffer without it. The Infrastructure Bank, as proposed, would be used to target large capacity-building projects not adequately served by current financing mechanisms including such things as mass transit systems, housing properties, roads, bridges, drinking water systems, and wastewater systems. 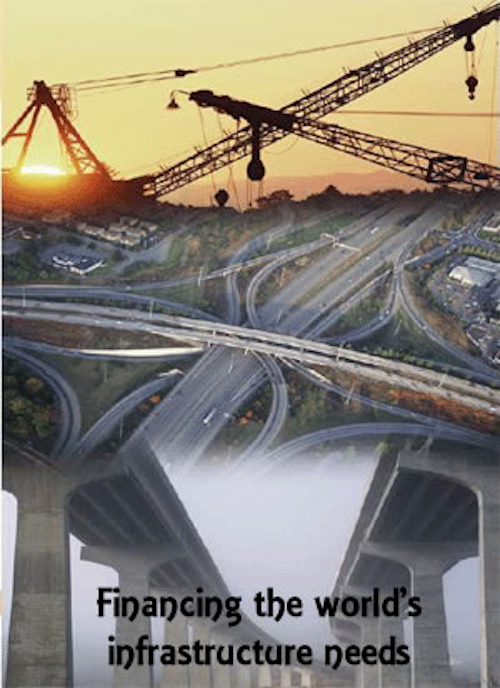 Projects would be selected on the basis of “national or regional significance,” the amount of federal investment to be determined on a sliding scale and based on the type of infrastructure, location, project cost, current and projected usage, non-federal revenue, promotion of economic growth and community development, reduction in congestion, environmental benefits, and land-use policies that promote smart growth. So, here is a radical idea. What if we scaled up this plan to the point where it became a global infrastructure bank? The global infrastructure is in truly dire straights. Contrary to what many are assuming, improving infrastructure in other countries will have both direct and indirect benefits here at home. We live in a global economy. Very few parts of the world remain disconnected from the rest. Any global infrastructure project will attract talent from around the world in the various phases of proposal, design, build, and completion. There are currently two institutions chartered to manage money on a global basis – the IMF and the World Bank. If you don’t know the difference between the two, you’re not alone. Both organizations were founded in Bretton Woods, NH in July 1944 when delegates from 44 nations decided to establish twin intergovernmental pillars supporting the structure of the world’s economic and financial order. Both are housed in close proximity, across the street from each other, very near the White House in Washington, DC. The fundamental difference between the two is that the World Bank is primarily a development institution, while the IMF is a cooperative institution that seeks to maintain an orderly system of payments and receipts between nations. The World Bank has one central purpose: to promote economic and social progress in developing countries by helping to raise productivity so that their people may live a better and fuller life. The role of the IMF is quite different. Set up as a voluntary and cooperative institution, the IMF attracts to its membership nations that are prepared, in a spirit of enlightened self-interest, to relinquish some measure of national sovereignty by abjuring practices injurious to the economic well-being of their fellow member nations. While the Global Infrastructure Bank will have some similarities to the mission originally conceived for the World Bank, it’s primary goal will be to fund infrastructure projects inside of its member nations, with contracts going to the companies also based within its member nations. Small companies take on small projects. Large companies take on large projects. But for the huge projects requiring massive amounts of capital expenditures, this is an area traditionally reserved for the deep pockets of national governments. Thinking beyond the scope of individual nations lays the largely unchartered territory of multi-country regional and global projects. As we put together plans for the GBank to breathe new life into the global economy through infrastructure projects, I would propose a new way of reviewing proposals, allowing the best of the best to rise to the top. I propose it only consider projects that can provide at least a 10-multiple rate of return on the investment dollars. The payoff can look like this. Please forget the engineering feats that will have to be accomplished for the moment. Let’s say Gbank puts $50 billion into a project connecting bullet rail from Mexico City to Rio de Janeiro. Travelers take to it like ducks to water. It takes 10 years to build, but less than 10 years to pay back the loan. The overall economic yield is well over 10 times the $50 billion ($500 billion). The payback happens very quickly, starting from the moment commuters start piling on the train, freeing up the investment money for other projects. The fact that it penciled out to a 10X rate of return, and later demonstrated it, means far less risk for GBank and a far safer environment for investment. New money is often created by “leading it into existence.” While the money would be backed by a league of member nations both on the giving and receiving end of the GBank’s benefits, most will be created through leveraged funds, backed by the projects it helps create. In later years, infrastructure expenditures could become infrastructure saving money, too. The world could see investment in transportation research. But, I’m getting ahead of myself. We can steer the world back onto a highway of unprecedented prosperity. But it will take more than national will and “bonus” money from ending the war in Iraq. The ticket lies in a true global vision. Join our mailing list to receive the latest news and updates from Thomas Frey. Do we have a fake people problem? Future of Healthcare – “Is Death our only Option?